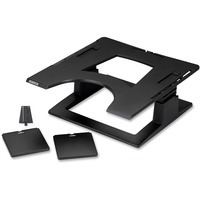 Raise your notebook to an ergonomically correct height with this notebook riser that is height adjustable from 4 to 6. Holes in platform help keep notebook ventilated. Cable management feature helps keep your cables under control. Use the notebook riser to free up space on your desk. Notebook riser includes attachments for shelves and 3M document holder and is compatible with docking stations sold separately. Nonskid base keeps your notebook steady as you work.